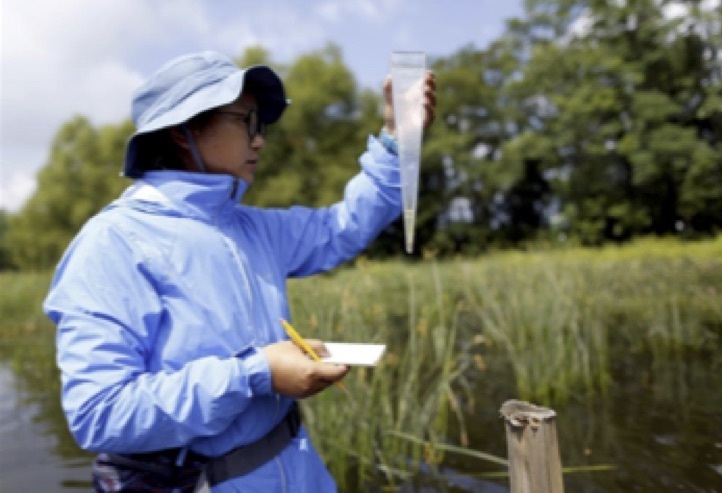 “Thanks to the generous support from the Wetland Foundation, I was able to travel between Buckeye Lake mesocosm site, Ohio, where the water samples were collected, and Everglades Wetland Research Park lab, Naples, Florida, where the water sample were tested. My research is mainly based on the idea of ‘Wetlaculture’ which is a term that comes from wetlands + agriculture. The goal of the ‘Wetlaculture’ experiments is exploring the potential of nutrient retention by wetlands with subsequent recycling back to agriculture/horticulture by using physical and mathematical models. The first mesocosm (physical model) site in Ohio was started in 2016, and 2017 was the first sampling year. The buckeye lake mesocosms have been designed and built successfully by the end of October, 2016. 30 tubs filled with local soil and planted with native species (Schoenoplectus tabernaemontani, Bulrush) are buried in the ground, which is designed to help the plants survive from cold winters (See Fig. 2). There are two hydrological factors, water level and loading rate, which were controlled. The first year biweekly sampling was started towards the end of April and continued through early October, which is the growing season in Ohio. I will continue to collect water samples during the wet season in the next two years which will be part of my Ph.D program. This long-term project is designed to be run at least ten years. Moreover, there are two more mesocosm systems that will be started in 2018. One is at Defiance, Ohio, which is near Lake Erie, the other one is in Naples, Florida.